Former Skills Minister John Hayes has called for more to be done to improve careers advice for young people in what he jokingly called his “comeback” to FE. Speaking on FE and skills for the first time since leaving the role, Mr Hayes said the sector had a lot to be proud of. He added: “I’m very proud that I established the first and long overdue National Careers Service. In calling for improved careers guidance, Mr Hayes, who was at the NCFE Upskilling the Nation conference on Thursday, February 6, joins voices from across the sector including the Association of Colleges, which recently launched the Careers Guidance: Guaranteed campaign on the issue. Careers guidance in schools has also come under fire from Ofsted itself. Mr Hayes, who served as Shadow Skills Minister between 2007 and 2010 and then Skills Minister from the 2010 General Election to September 2012 when he was succeeded by Matthew Hancock, further said the reforms to the school system under Education Secretary Michael Gove would have a positive impact on colleges. “By reforming the school system way we will remove the need for the FE system to act as a remedial sector which compensates for the failures earlier on,” he said. 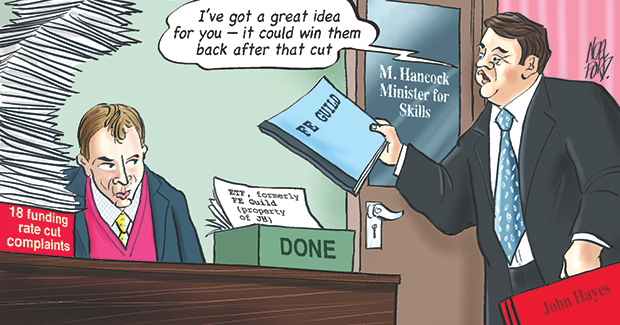 He also spoke to FE Week about the Education and Training Foundation, an organisation which was first thought up as the FE Guild during his time as Skills Minister, but was brought to life under Mr Hancock. Mr Hayes said: “I think the journey we travelled is a long one it’s an ambitious set of objectives that we set out and I think we’re on the road to achieving those ambitions. “I remain committed to the idea that part of the solution to the problem of driving up standards is that you have to have a twofold approach, with employer involvement and with an FE sector which has sufficient status to be regarded by employers as the right place to go to get what they need. He finished by saying that he was optimistic about the raised profile of the FE sector. “When I first became the Shadow Minister, how often did you hear ministers talking about skills and apprenticeships as part of their routine political dialogue?” he said. “Now, the Chancellor or the Prime Minister barely go a day or a week without mentioning skills, and they have listed apprenticeships as one of the core achievements of this government. “When I first started talking about apprenticeships, I was regarded as a bit odd. The report of the National Careers Council is significant in this regard. A statement from the Chair will follow shortly on progress being made by Government re: Creating a culture change in careers provision. More work is needed urgently to accelerate the careers offer to young people in 2014.